Everyone has different reasons for seeking a better understanding of basic electronics. Whether you want to advance in your career, start a new hobby, or refresh your dormant skills, comprehending basic electronics can be anywhere from daunting to electrifying (literally, if you are not careful). Learning electronics can be intimidating with being introduced to so many new concepts and formulas all at once and may even discourage some beginners. That is why Easy Electronics by Charles Platt is the perfect book for true beginners to this field of study. Easy Electronics was written to be as simple as possible for you to learn basic electronics. Requiring no tools at all, you will complete practical experiments with the electronic components provided in the Easy Electronics Kit that provide a foundation to open up the world of electronics to anyone. After the success of our electronics kit for Make: Electronics 2nd Edition (the successor to Easy Electronics) Charles asked us if we would make a kit for Easy Electronics, which we were very happy to do. Do to this we at ProTechTrader have been in constant communication with author Charles Platt from the start of Easy Electronics to make sure that our kits contained all of the exact parts he used while designing and testing the experiments. The Easy Electronics Component Pack or Easy Electronics Kit and Book Bundle will take all of the guesswork out of finding and sourcing the components it for readers, in turn making the book live up to its name even more. From custom lengths of color coded jumper wires and alligator clip test leads to a low voltage piezo transducer matching the output of the 7555 Timer Circuit (that’s right, 7555 not 555 timer). Easy Electronics Kit and Book Bundle Includes everything in the Easy Electronics Component Pack along with the Easy Electronics Handbook all in one convenient package. 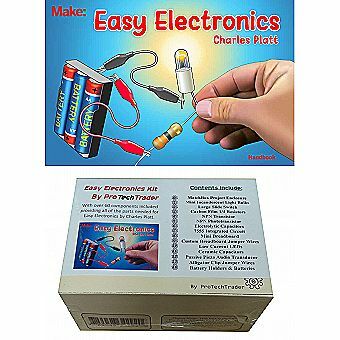 Electronic Components needed for experiments in Make: Easy Electronics Handbook by Charles Platt conveniently packaged in a custom made fake matchbox which is used an electronics project enclosure in an experiment. Components are individually sorted in reusable envelopes printed with identification details including name, electrical schematic diagram symbols, and experiment number references to allow you to quickly find the part you need. Designed for the complete beginner in mind the component pack has all of the parts you will need including a mini solderless breadboard, small incandescent light bulbs, custom jumper wires, large slider switch, 7555 timer circuit, low-current LEDs, low-voltage piezo transducer, a phototransistor, and more! Also includes all of the exact 1/4w carbon film resistors, ceramic and electrolytic capacitors, transistors, alligator clip test leads, battery holders, and batteries you need for the experiments in Easy Electronics. From best-selling author Charles Platt, the Easy Electronics book and kit should satisfy anyone who has felt frustrated by entry-level courses that are not as clear and simple as they are supposed to be. This is the simplest, quickest, and least technical, introduction to basic electronics you can find. Brilliantly clear graphics take you step-by-step through 12 basic projects, none of which should take more than half an hour. Using alligator clips to connect components, you see and hear immediate results. The experiments introduce you to switches, resistors, capacitors, transistors, phototransistors, LEDs, audio transducers, and a silicon chip. You'll even learn how to read schematics by comparing them with the circuits that you build. No prior knowledge is required, and no math is involved. You learn by seeing, hearing, and touching. The Easy Electronics kit provides everything you need to successfully complete every project in the book at an affordable price. And more. Start experimenting right away! The hands-on approach is fun and intriguing, especially for family members exploring the projects together. This 6” X 9” handbook consists of 50 pages of full-color illustrations and-easy-to-understand explanations and instructions. Comes with incandescent bulbs, LEDs, capacitors, resistors, a phototransistor, 7555 timer, piezoelectric audio transistor, and more. No tools are required to perform the experiments — the components included in the kit are all you need. The projects are suitable for anyone with no prior experience, including younger students working with adult supervision. Charles Platt is a Contributing Editor and regular columnist for Make: magazine, where he writes about electronics. He is the author of the highly successful introductory hands-on book, Make: Electronics, and Make: More Electronics. Platt was a Senior Writer for Wired magazine, and has written various computer books. As a prototype designer, he created semi-automated rapid cooling devices with medical applications, and air-deployable equipment for first responders. He was the sole author of four mathematical-graphics software packages, and has been fascinated by electronics since he put together a telephone answering machine from a tape recorder and military-surplus relays at age 15. He lives in a Northern Arizona wilderness area, where he has his own workshop for prototype fabrication and projects that he writes about for Make: magazine.